The security landscape has changed in recent years. New Cyber Security intrusion detection & alerting solutions are required to detect security threats at the time they occur. Deep analysis of system log files from all various sources, including application servers is required to detect complex attacks such as APT attacks (advanced persistent threats). 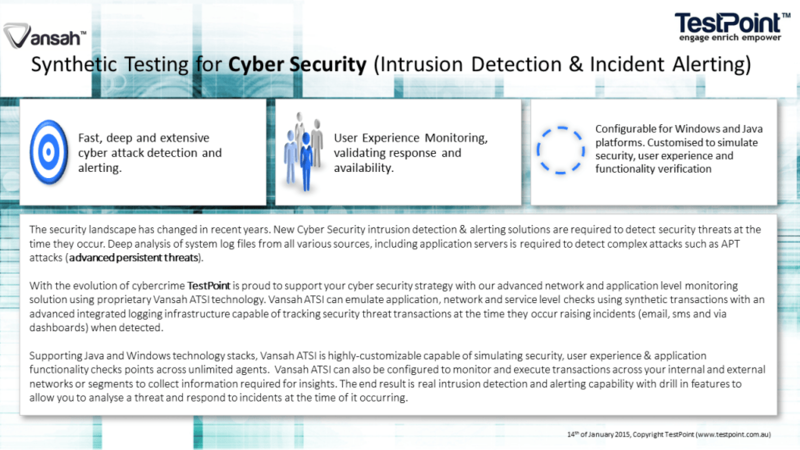 With the evolution of cybercrime TestPoint is proud to support your cyber security strategy with our advanced network and application level monitoring solution using proprietary Vansah ATSI technology. Vansah ATSI can emulate application, network and service level checks using synthetic transactions with an advanced integrated logging infrastructure capable of tracking security threat transactions at the time they occur raising incidents (email, sms and via dashboards) when detected. Supporting Java and Windows technology stacks, Vansah ATSI is highly-customizable capable of simulating security, user experience & application functionality checks points across unlimited agents. Vansah ATSI can also be configured to monitor and execute transactions across your internal and external networks or segments to collect information required for insights. The end result is real intrusion detection and alerting capability with drill in features to allow you to analyse a threat and respond to incidents at the time of it occurring.